I’m excited to be one of the authors taking part in the Christian Fiction Readers Retreat One Day Event, and I wanted to be sure you had all the information so you can plan to attend! I’ve invited the three women who are organizing the event to to be my guests today to tell you all about it. Welcome, Bonnie, Carrie and Annie! Come join us at the Christian Fiction Readers Retreat One Day Event (CFRR) in Nashville, TN this summer! Our event theme is “Honoring God through Christian Fiction.” Enjoy speaker sessions, author panels, breakout sessions, prayer & worship and author signings with your favorite Christian fiction authors! With 30+ authors, food, swag (including free books), games and TONS of giveaways, you don’t want to miss this event! When is it, you ask? For more information, including schedule, authors list, registration info and other logistical questions, check out our website HERE, or click on the image above. Registration is now open! Late registration begins on June 16th. Once capacity is reached, registration will close. So hurry up and register! To go ahead and register, just go right HERE. 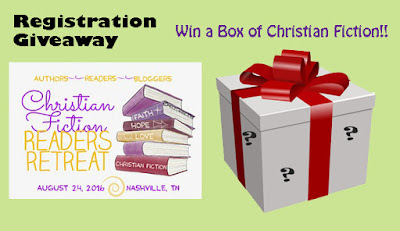 AND for the first giveaway at the event, all those registered can enter for the chance to win a BOX of Christian Fiction from the stewards of the event. Just click on the image below to enter. (Link also available on our website).